This description of Kara Bobroff's work was prepared when Kara Bobroff was elected to the Ashoka Fellowship in 2018. 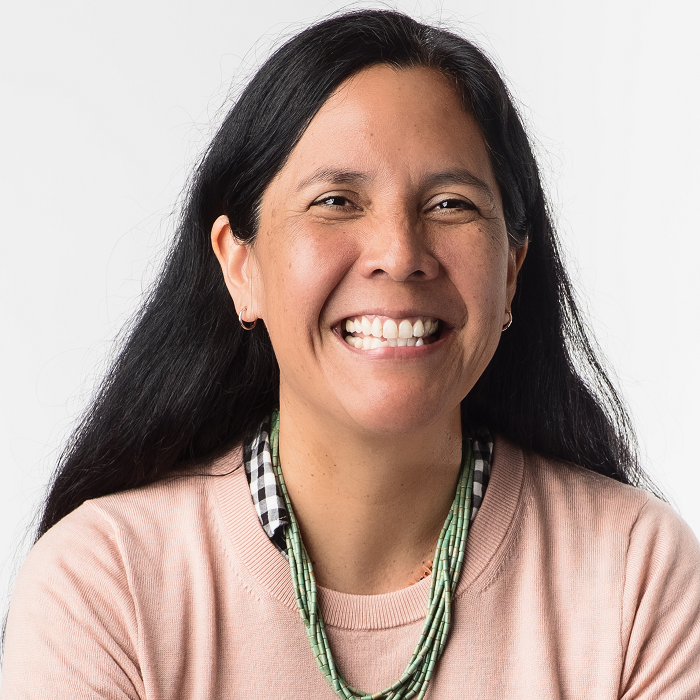 Kara has worked with her community to build a new model for educating Native American youth, one that emphasizes holistic well-being and college preparedness by rooting young people in their culture and community. Further, she has built the infrastructure to spread and scale that model by identifying its crucial components, teaching them to others, and supporting the educators who do this work in overcoming common barriers. She does this through NISN or the NACA-Inspired Schools Network (NACA, or the Native American Community Academy, was the school she founded to realize the model). This model provides opportunity for some of the most chronically underserved students, families, and communities, and those most poorly served by existing educational methods. Kara has discovered that students in Native American communities, who often are not served well in traditional “one size fits all” schools, thrive when their education is re-connected to their identity, their culture, and their community. This bolsters the sense of self and self-esteem and changes the experiencefrom one of alienation and struggle to one of connectedness and possibility. Kara emphasizes not just academic excellence but also student well-being, a crucial concern for a student population with high rates of poor health due to systemic issues that have been allowed to persist for generations. Where the traditional school system often frames Native American youth in terms of deficits, characterized by the poor educational and health outcomes they too often face, Kara frames young people in terms of their strengths, as assets to their community and the next generation of leaders. The education system is a key leverage point for improving the lives of Native American young people, because it reaches every young person and shapes their life outcomes far into adulthood. Historically, education has been used as a tool to forcibly and often abusively assimilate Native American young people into mainstream American culture by stripping away and punishing all aspects of Native American identity and culture, as in the federally-run boarding schools of the 19th and 20th centuries. The NISN approach reclaims and reimagines education as a means to connect youth with their identity and community, rather than diminish these things, and to support young people’s holistic well-being rather than simply push them through a one-size-fits-all school model. What’s more, while many families and communities associate the school system with pain, trauma, and loss as a result of its history as a tool for assimilation, Kara’s insight is that reconnecting them with their children’s schools, building their faith in education, and showing that they can be involved in the direction these schools take to educate their youth unlocks a powerful new constituency that has previously been left out. NISN educators support this reconnection and demonstrate this mindset shift in how education can and should work, as a lever in the hands of communities rather than a weapon wielded against them. The NISN network works to remove barriers to culturally-responsive education, including lack of Native teachers and school leaders and lack of available curricula centered on the experience of Native communities and youth. They support individual educators through a two yearlong, funded Fellowship that provides intensive training in how to engage with communities and found a school, while also providing lower-touch tools for broader adoption of the model, like the Resource Sharing Hub that reaches teachers nationwide and builds their capacity to provide culturally-responsive education. Inspired by the Native American Community Academy that NISN Fellows and communities founded, today eight NISN schools currently operate in three states, with the goal of expanding to support Native young people nationally and even internationally. the United States. The 23 recognized tribes in New Mexico are comprised of diverse and vibrant living cultures. But crushing poverty, displacement, and cultural and linguistic alienation continue to contribute to tragic outcomes for Native Americans and especially Native youth. Often Native youth are in crisis as a result of the impact of poverty and historical trauma. There are numerous statistics reflecting those outcomes, documenting poor health, high suicide rates, and low educational achievement. This data is vitally important, but statistics tend to tell only one story about Native communities, highlighting deficits. Cultural assumptions and values inevitably shape the metrics we use to assess and define communities and determine the kinds of approaches we take. This can lead to solutions that are designed to address the statistics themselves rather than engage living, interconnected, and creative beings. Relying solely on standardized test scores and educational achievement statistics is not enough nor rigorous as a means to addressing the long lasting impact of a system that has failed Native youth, for example, frames Native youth in terms of shortcomings, frequently subjecting them to punitive interventions. This has proven to be an ineffective approach, often imbued with discriminatory biases, and worse, is a deeply disempowering narrative for Native students, which is itself contributing to a legacy of unrealized potential for generations of Native youth. In other words, poor academic outcomes are a serious problem but so too is how we define and frame the problem of poor academic outcomes for Native students. Native American children shouldn’t be learning in school that they are a problem that needs to be fixed. The contributing causes to poor academic outcomes for Native students are multiple and have their roots in an extended historical trauma, but the unifying, underlying source of systemic educational failure for Native American students is a persistent cultural deprivation and denial. Overt discrimination, a lack of Native teachers, and limited or no lessons on Native American history or culture has resulted in a public education system that lies at the heart of maintaining the marginalization of Native Americans. But if the impacts of cultural deprivation are formidable, so too are the impacts of cultural connection. While mainstream interventions for high-risk students have met with limited success for Native students, quantitative and qualitative research has documented the positive impacts of incorporating Native language and culture into classroom curriculum and Holistic Wellness, including greater academic achievement and lower dropout rates. NISN educators are forming their own charter schools, transforming BIE (Bureau of Indian Education) schools in their communities into tribally-led self-determined schools, and working with public school leadership teams to prioritize cultural relevance and academic excellence to impact school design toward more Indigenous Models of Education. There are eight schools operating currently in the network serving more than 1,200 students and eight more in the pipeline. Currently the network operates in New Mexico, South Dakota, Colorado and Oklahoma. NISN schools start by engaging community partners and catalyzing community involvement. NACA itself was founded in collaboration with 150+ community partners and special advisors. A key priority of the model is integrating the diverse perspectives and values of local Indigenous communities. Another is instilling hope for the future by honoring the voices of Native families, and reinforcing the worth, strengths, gifts and potential of their children. This work builds the foundation for the model’s and the youth’s success. A connection to culture, family involvement, and a commitment to an affirming strength-based approach to education result in improved educational outcomes and improved holistic well-being for students. 92% of NACA students graduate who start, a rate 27% higher than the local public schools, and 100% of graduates apply to postsecondary programs. They have also closed the graduation gap between boys and girls (typically girls graduate high school at a higher rate than boys). NISN’s success is measured partially through traditional educational success metrics (graduation rates, Advanced Placement course enrollment, college success), but they have also built their own metrics for tracking cultural relevance, student wellness, and family and community engagement. 90% of the educational day incorporates identity development, holistic wellness, Indigenous leadership and culture into the coursework. NACA and other NISN schools use a variety of approaches to ensure that the education they provide is deeply community-rooted. A key method is incorporating Indigenous languages into the school day. NACA offers courses in five Indigenous languages to students and different NISN schools offer different languages depending on the communities served. This often requires schools to recruit teachers from the pueblo communities in the cases of languages that are infrequently still spoken. Another is building mindful curricula that teach a respectful and accurate history to students and creating opportunities to apply innovations to their current context grounded in key cultural and core values. NACA, for example is housed in a building that was historically a boarding school for Native American youth when such schools were designed to assimilate students into the predominant white culture. Students are educated about that and other aspects of their community’s history, covering knowledge that is not predominantly taught in mainstream schools. Different NISN schools incorporate different components in order to be rooted in the varied communities they serve. One school, for example, near the border with Mexico, places special emphasis on Mexican Indigenous history and languages. Another school has a robust agricultural curriculum per the community’s request or dual language program focused on increasing the Dine’ Language. The NISN network supports schools through common logistical obstacles, including getting a new charter school approved, hiring and retaining quality staff, and securing space and supplies and support for reflective practices and growth. Educators support other educators, sharing knowledge and skills including curricula, best practices and research, sample lesson plans, and resources across subject areas and grade levels. Educators build not just a base of crucial skills but also an identity as a culturally-responsive educator backed by a network dedicated to the improvement of outcomes for Native American youth. With this network bolstering them, new and transformed schools are much more likely to succeed. Beyond the Fellowship itself, their online Resource Sharing Hub has over 2,250 current users, and supports teachers regionally and nationally in developing locally-relevant, comprehensive plans useful in their own curricula and contexts, This content is open to all educators interested in culturally responsive education and represents a low-touch method of spreading their model along with the high-touch Fellowship. Kara grew up in Albuquerque, New Mexico disconnected from her Navajo and Lakota culture, language, and community. Her biological parents were unable to raise her and her sister, and removed from her family and Native community, she experienced internalized racism and negative stereotypes of Native people from the school system and surrounding Institutions often offered negative portrayals of Native people. A lack of role models and cultural or historical representation in her school curriculum made it extremely challenging to build a positive identity as a student. In the first grade, she was subjected to racial slurs by another student, and although her family made it clear that that kind of language and treatment was unacceptable, she didn’t speak in a school setting after that until the fourth grade. Shesucceeded in her K-12 years at great cost to her own sense of self, which had repercussions through her young adult life, including nearly driving her to drop-out of college. This disengagement from identity is a common experience for Native American youth and many youth of color whose identity is not supported or recognized as a core strength. It wasn’t until she began her work with youth at the age of 19 that she found her calling. Her adopted parents were educators and following their example she pursued a career in education. She was in college when she first encountered the history of Navajo Education and the use of boarding schools for Native American youth, beginning in 1860. These schools were designed as places where Native youth would be assimilated but also individualized, with the goal of eradicating all traces of Native life, family connectedness, language, and communal culture. Even though these boarding schools no longer exist, it was clear to Kara that much of the philosophy remained in modern education. For too long, the education system has perpetuated a cultural genocide and a genocide of the imagination by presenting assimilation as the only way forward. She began to wonder what a school designed around Indigenous education might look like. Her experience as a Special Education teacher and mental health worker grounded her in a holistic view of education. Another turning point for her was leaving Albuquerque to teach at an affluent, high-performing school in Marin County, California, then returning to New Mexico to serve as the Principal of in a low performing school, on the Navajo Nation. A key difference between those schools was not just the disparities in resources but the level of accountability to the community and consideration of the values of the students, families and community. The community in Marin was engaged, and demanding, but in the four corners region there was a divide between the school and community. There wasn’t any type of youth leadership structure and there was little encouragement that inspired parents/families to be engaged– later she realized it was marginalization and oppression at play – a notable and intentional divide in some serve cases that kept the community from engaging with the school. The differences between these two individual schools could not have been starker and they have proved to be indicative of a systemic disparity. Native American students overwhelmingly attend low performing, under-resourced schools, underperform in comparison to their peers, face multiple risk factors, and often lacked programs or access to opportunities to create a strong vision for their futures and access to higher education or opportunities. Her teaching experiences were a transformative moment. The School improved dramatically and began to engage the community, provide relevant courses, more support for teachers and growing local educators who represented the community and students. Student had more voice and positive youth development opportunities. Native kids deserve better. She returned home to Albuquerque and decided that she would work with the community to launch a school that promoted healing, connection, culture and core values that supported students academically, and ensured a strong identity.